A Ransomware attack encrypts critical files and systems and renders them inaccessible to the owner. There are entire ransomware outfits working out of office buildings, making the stealthy and disruptive pieces of malicious software, and designing deceptively simple schemes to infiltrate small to medium-sized businesses. The overhead is low and the profits are high. Bitcoin is anonymous and the list of targets is endless. Coupled with the technology being not overly complicated, the odds of getting caught are low. Ransomware perpetrators are sophisticated, profit-hungry, cybercriminals on the lookout for unsuspecting small to medium-sized businesses (SMB) to infiltrate. To get in to your systems, they may send a phishing email to your staff. Because 94% of people can’t distinguish between a real email and a phishing email 100% of the time, the perpetrators are successful in getting in. And if they don’t, they keep trying again and again until someone in the business finally clicks the malicious link that initiates the whole Ransomware scheme. And once you have paid a ransom, you can be sure that they will try again. MethodIT provides four layers of defense against malicious malware such as Ransomware. MethodIT works with Cisco Umbrella to protect you BEFORE the threat even reaches your network. 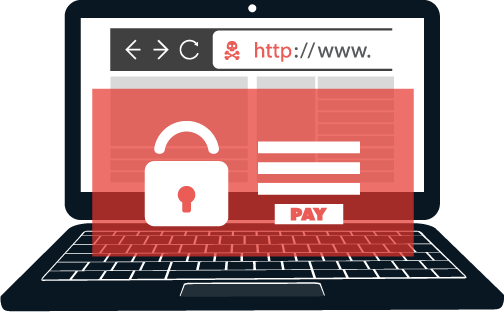 With Ransomware files, they act as a Trojan horse, where the file is deemed harmless by your firewall and permitted entry into the inner part of your network. Once inside, it lies dormant for a certain time period or until it is triggered. Then, the file reaches out to a malicious domain and downloads all of its harmful data. Suddenly, your business network is infected, and it is already too late to stop the attack. Cisco Umbrella is cleverly designed to prevent these sorts of attacks by merging with your DNS regulator. Companies with Cisco Umbrella simply modify their active directory to use Umbrella as their DNS regulator instead. Umbrella itself includes an enormous directory of innocent, suspicious, and malicious domains that is constantly growing. Also, “New” Domains are also tracked. Now, whenever a user on your network sends a request to the Internet, Umbrella compares the requested domain to their directory of suspicious domains. If the domain is known to be malicious, the traffic is immediately blocked. If “New” it is monitored and blocked until it is confirmed ‘safe’. Ransomware detection “BEFORE” it hits your network. MethodIT partners with Sophos to protect your network with ALL the protection you need to stop sophisticated attacks and advanced threats while providing secure network access to those you trust. Sophos Sandstorm uses next-gen cloud-sandbox technology to give your organization an extra layer of security against Ransomware and targeted attacks. It integrates with your XG Firewall and is cloud-delivered so there’s no additional hardware required. Sophos Sandstorm blocks evasive threats like Ransomware, disguised as executables, PDFs, and Microsoft Office documents — sending them to a cloud-sandbox to be detonated and observed in a safe environment. Threat intelligence is fed back to your XG Firewall and the file blocked or permitted. The process takes just a couple of minutes with minimal impact for the user. Anti-virus software on your computer in the past (and even present) depended on a list of known viruses that the anti-virus software uses to isolate intrusions. This is the traditional method of ‘blacklisting’ (i.e. a file is either GOOD or BAD) as the standard method of protection. What MethodIT – in teaming up with WebRoot – does is extend your endpoint security to an essential next step. In the field of detection it is adding the category UNKNOWN (to GOOD or BAD) to this classification. However, it is always possible that an organization gets infected by a virus or malware, despite the security measures. Therefore, it is advisable to use a security solution that can retroactively eliminate the harmful effects of such an infection. An UNKNOWN file is monitored closely and watched to see which files, registry keys and memory locations it alters. The journaling function then records and remembers the before and after state of each change made. Since every action is meticulously journaled in the event the UNKNOWN file is later classified as a threat, everything it has done can be rolled-back to return the endpoint to its pre-infection state. A data protection solution like Datto provides the ultimate failsafe in a layered defense strategy against Ransomware. A data protection solution will automatically and invisibly take snapshots of your data and systems at regular intervals, and store that data in a secure location. Should Ransomware successfully penetrate your layered defenses, you can simply ‘turn back the clock’ to a snapshot of your business before the attack happened. No ransom, no downtime, no problem. We can restore files and systems if needed from a backup device on premise or from the ‘cloud’. Partner with MethodIT so that you will never have to pay a Ransom to Cybercriminals.